Every gardener needs a sturdy garden shed, if only to store garden tools. Although architects and realtors are calling these structures "garden buildings" and recommending them for all kinds of purposes, real garden sheds are truly designed for functionality. Before you make any decisions about your garden shed, check local ordinances, building codes, and neighborhood covenants. A farmer can build outbuildings anywhere on his acreage, but urban and suburban homeowners often have to cope with restrictions on design and placement of buildings. Consider neighborhood conventions as well. A garden shed that your neighbors consider an eyesore will not make for friendly relationships. Consider the best place to put your garden shed to make it the most useful. The back corner of your property may be the most conventional location, but that doesn't mean it is the best location. Don't put your shed on the most fertile soil in your garden and don't place it where it will shade a garden bed during the growing season. You need water for many garden tasks. Try to place your garden shed near a convenient water source. Your garden shed should be conveniently located, because you'll be using it regularly. You may want to place it near an existing path. If not, you'll probably have to create a new one. Garden shed styles are most often characterized by the type of roof. The roof not only determines the overall look, but the storage capacity of the shed as well. Gable: a classic "peaked" roof with two sloping sides meeting in the middle in a ridge. 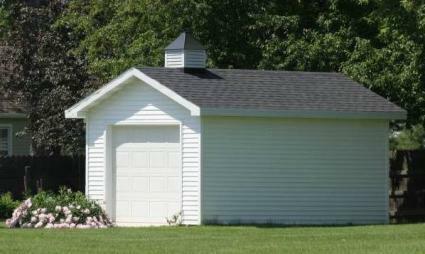 Gable roofs are the most common type of roof for sheds and the easiest to build. Gambrel: a "barn-style" roof that evokes country feel. It is similar to a gable roof but instead of one slope on each side, there are two. The top panel has a gentler angle which creates extra space inside for storage. 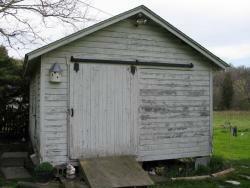 Salt Box: similar to a gable roof, but one side is shorter than the other. Salt box sheds provide more headroom and storage space on the tall side, making it a good choice for smaller gardens or corner plots. Hipped: has four sides that all slope towards the middle, either meeting at a center point, like a pyramid, or along a ridge. Hipped-roofs give a shed a quaint "cottage" look. Lean-to-a shed built next to or against an existing structure. The roof slopes away from the building it is attached to. Ideal for small gardens. Some gardeners need large sheds, while others are comfortable with small ones. The most common mistake is having a shed that is too small. If you have to remove a lawn mower, garden cart, and rototiller before you can work at your potting bench or screen your compost, your garden shed will not be as useful as you had hoped. Make sure the door to your garden shed is wide enough to move your equipment in and out easily. Bumping the doorframe every time you move a wheelbarrow is a real nuisance!If your shed is elevated, you'll need a sturdy ramp. Door sills should be low and smooth. You'll want a lock on the shed door. Garden equipment is expensive and a lock will deter thieves. More important, it will keep curious children away from sharp tools and garden chemicals. Whether you buy a storage rack, install pegboard, or just drive nails into the wall, you'll need somewhere to hang garden tools. The more places you have to hang tools, the better. If your shed is tall, you can hang baskets and other items from ceiling hooks. Make sure all hanging storage is secure. You don't want a pitchfork falling on your foot. You'll need plenty of shelving to hold containers of fertilizers and weed killers, pots and trays and screens, and many other useful items. Some gardeners prefer a built-in potting bench, while others prefer a wheeled bench so they can work outdoors in good weather and indoors when it rains. You'll need large bins to hold compost, potting soil, mulch, and other bulky garden materials. Make sure you have enough room to store your large gardening equipment. You may only need to have enough space for a wheelbarrow or you may need to house a rototiller, garden tractor and trailer, riding lawnmower, and snow blower as well.